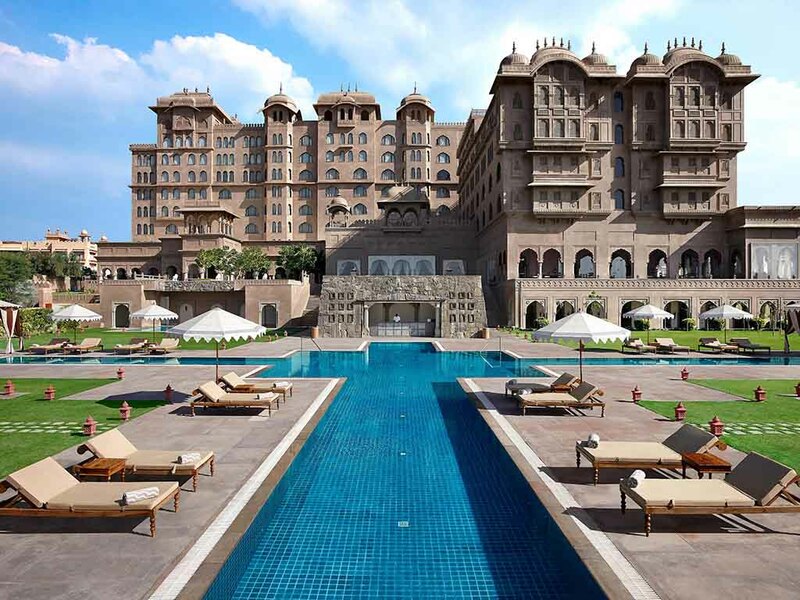 Fairmont Jaipur is an ode to the pink city through its awe inspiring architecture and decor inspired by the Mughal dynasty and Royal Rajputs of yore. Nestled amongst the majestic Aravalli hills all 245 rooms and suites are elegantly appointed to reflect a perfect blend of traditional Rajasthani decor and modern amenities. Fairmont honours the rich heritage of Rajasthan with the design and attention to detail on display in each of the 245 guest rooms, all meticulously decorated and featuring timber doors, private foyers, vaulted ceilings. With a minimum of 50 square metres of space as well as such modern conveniences as large soaker tubs, lush bed linens, 40 inch plasma televisions, and wireless high-speed Internet access. The Chef takes a novel approach with the use of dominant Indian favours, while paying tribute to the Persian influences of each dish, in order to familiarize the modern day gourmand with traditional Indo-Persian cuisine. Swim up to the deck and enjoy a refreshing cocktail poolside, in a beautiful shaded area of the hotel's large outdoor pool. Our exclusive pool bar also offers a wide range of delicious snacks and small meals, ideal for filling up after a swim. All Day Dining Restaurant. Located on the ground floor features a tempting buffet as well as a full a la carte menu including a special emphasis on traditional Rajasthani fare.Convenient entended hours. Anjum, the tea lounge and day bar is quite literally the constellation of beverages. Shimmering with ornate murals and comfortable lounge style sofas all around, the view of Willow Stream Spa gleaming against the azure pool is a sight to behold. Warm, masculine and sophisticated, the Cigar Diwan is a private den where you can escape the frivolity and languorously inhale the pleasures of fine tobacco. The property and the interaction with the hotel staff was excellent. The restaurant however was very slow in service ( not the interaction itself and that was fine). It took inordinate time to get an order when placed food, cutlery, etc. Only had breakfast and the food tasted fine. My lost lower not being recovered. I checked out on 8th April'19 and I had left out my lower (Jockey make) in the bathroom at Room No.240. I came to know it after returning back to Delhi and called up at Reception to help me to recover my stuff and send back to me through courier. But unfortunately, no revert and no recovery of the same. Not expected it from Hotel of such a repute. Stunning hotel in Jaipur. The hotel is fantastic: beautiful room, great facilities (pool, spa, fitness), bars, lounge. Great staff; very caring. Breakfast was also very good. The property is really beautiful, Rajasthan's culture has been truly represented. Well maintained & clean property. Welcome and Departure was really royal, great experience. The rooms were exquisite and very well appointed . The staff were very courteous and welcoming . The whole ambience was so Rajasthani and traditional it was almost palatial living. A Pleasant Resorts, Courteous Staff. Courtesy, Services, Amenities, Location, Food Qualities,All to Gether Full Marks. Fairmont staff made our stay Very very Pleasant, exciting and simply Bombastic. Starting with fabulous, signature welcome like into a fortress/Palace, front desk staff Abida & Kalyani made the Check in process very nice experience. They were so mindful, By design they have allocated us room number matching my wife’s birthday & month, that was falling next day. The hotel staff made her birthday such a memorable event with unbelievable amount of pampering. . 21st being her birthday, the staff arranged a delicious birthday cake with fireworks at 24:00 hrs on 20 March and repeated next evening with Happy Birthday written on the bed with At the restaurants, the staff and food have been another amazing story. Srushti along with her colleagues made the breakfasts, lunches and dinners, so so enjoyable times. All in all, it’s been a fantastic stay and experience. We appreciate the hospitality of all the staff and the ambiance of the hotel. Check in was smoothly done by joy but Check out took forever and ended up paying extra INR3800 due to a wrong beverage bill closed on our room (the bill of 8 coffees and 6 chai was opened before we checked in). Mr. Jay and communications department should focus on the response skills. It has taken me 10 days to get response from the department managers stating refund will be processed. No card details taken, No courtesy call noting. The booking was prepaid through my sisters indian CC and not sure how will i get hold of the refund residing in Australia. Perfect. The staff is very friendly, the food is great and bedrooms are the best. The stay and the arrangement made by the hotel and staff were excellent. Couple of points i would like to make: 1. In room dining messed up the order a couple of times 2. As a member i should have been offered a discount on F&B. Loved staying the Fairmont Jaipur. The welcome with the drums and rose petals were amazing and the service throughout the hotel was great. The rooms are big, designed beautifully and stone bathtub was unlike anything we've seen before. Staff remembered our room numbers at the restaurant. Jacuzzi, steam and sauna were great, added plus is that we had the whole place to ourselves when we stayed. Only issue was that check out process was kind of slow and when we ordered a body pillow, it came quite stained. Location is also quite far from the city. The kind of service provided was amazing. The entire experience from check in to check out was superb.. The way we got a hotel show-round by Varun and he was very extremely helpful. The special mentions to Sumit from reservation and Abida from reception for all the arrangements. Thank you for making my surprise beautiful and successful. Can't wait to come back!! Beautiful property, Exquisite large rooms, beautifully designed washrooms, courteous staff, but a bad breakfast buffet spread. When everything goes well, it just takes 1 bad moment to spoil the entire experience. The breakfast spread was poor and the taste of the food served was below average. The gym lacked basic facilities and seemed to be developed just for the sake of having one. The fowl smell from the adjacent property was a spirit dampener too. The ambience is amazing !! Staff's temperament and eagerness to give the best experience to their guest are clearly visible which further enhances the guest's experience at Fairmont. Big wedding took all the intention. Our stay was extremely comfortable. Sometimes the service was on the slower side for tea, coffee or food. Everything else was very good.